The ACE satellite measures the solar wind speed (among other things) of particles traveling from the Sun towards the Earth. Located at the L1 libration point it is always around 1.5 million km in the direction of the Sun and so can give about an hours warning of space weather changes. The solar wind speed is typically in the range of 300 to 700 km/s. This 1 minute interval real time data remains available for only a short period of time. The present analysis was done on data recorded on 11th July 2015 and there are 1440 (less about 20 or so missing) measurements at 1 minute intervals. The analysis was done using our free CATS software. The first two listed cycles in particular are extremely significant and would not occur even one time in a hundred million by chance alone. The Bartell’s test shows the significance of cycles as a probability. They did occur in two different days that I analysed, with extremely similar periods. 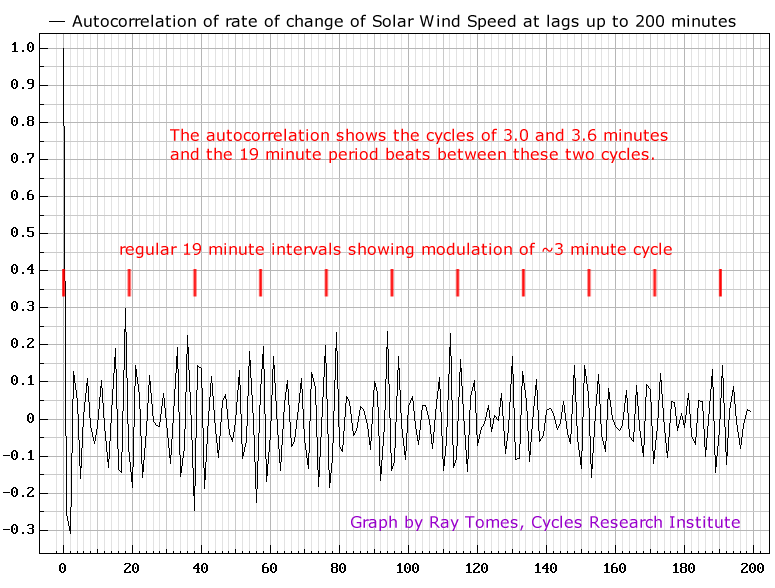 This shows how the change in solar wind speed compares to the corresponding change at lags of up to 200 minutes and it can be clearly seen that there is a cycle of 3 minutes or so, and also that there is a modulation of 19 minutes in the autocorrelation. The two dominant cycles periods will produce beats of 18.92 minutes just as we observe. Note that there are two actual cycles near to 19 minutes also. The author has often found cycles of near 3 and 6 minutes in the solar system previously. Along with 80 and 160 minutes these periods are rather common. We may note that the inner planets are roughly spaced at 3 light minutes apart in distance from the Sun, and the outer planets at 80 light minutes apart. In my previous post to CRI Blog, I reported on Kotovs method of analysing planetary distances from the Sun gives spacings which are multiples or fractions of 0.376, 0.734, 5.01 and 10.06 AU. Light travels 1 AU in 8.317 minutes, so these distances can be converted to periods of an electromagnetic (or gravitational) standing wave of 3.13, 6.10, 41.7 and 83.7 minutes. 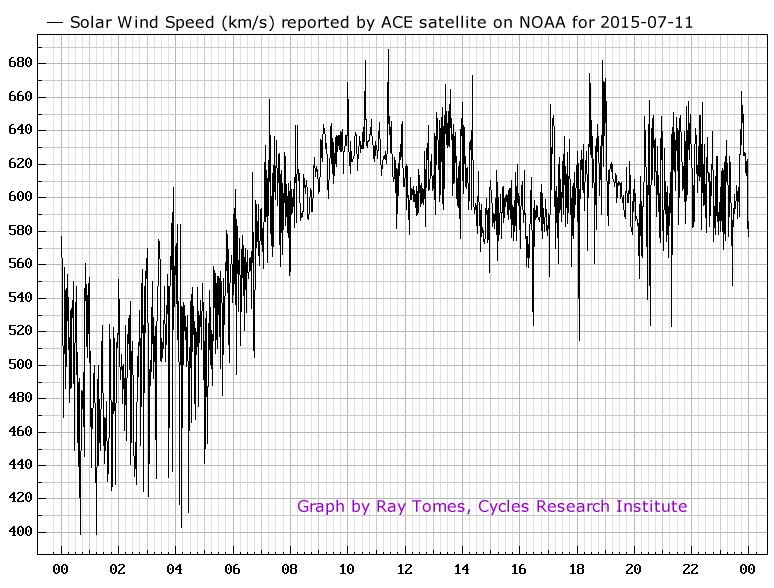 In the solar wind speed as well as many cycles around 3 minutes or so there are a number at a little over 6 minutes. Two periods of 3.17 and 6.34 minutes have also been found by the author in fluctuations in the rate of radioactive decay of Plutonium as measured by Biophysics laboratory at Russian Academy of Sciences in Pushchino. These periods are not perfectly steady but wander about by around 5%. 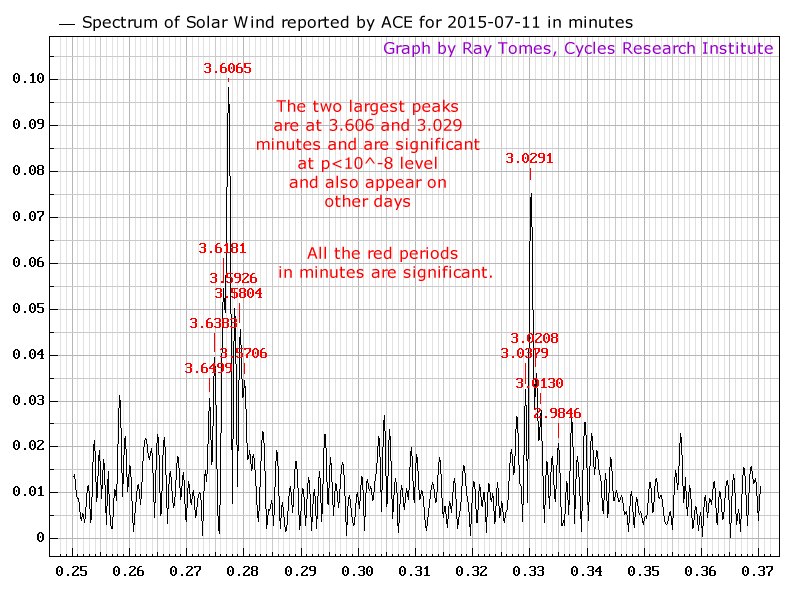 This entry was posted in astronomy-Solar, cycles-Analysis, physics-Wave_Structure and tagged .solar, 3 minutes, 3.029 minutes, 3.606 minutes, 6 minutes, Kotov, solar wind speed, speed, wind. Bookmark the permalink.